But often when u pull one tissue out another one comes with it. Also not great to reseal multiple times. Great on the go tissues. They are nice and thick so they do not break easily. We only get Kleenex Aloe Vera, and that includes the Pocket Pack. We suffer from allergies and find these the softest for sore noses and convenient in a travel pack! The Kleenex Aloe Vera Tissues are my fav because they are soft on my nose! I have allergies and always need tissues on the go so this keeps my purse tidy! Love that Kleenex have these travel packs. We also use them in the larger box. They are soft to use and easy to throw in your hand bag or luggage. As per my review for the box of Kleenex Aloe Vera one , this is exactly the same quality except it comes in a handy pack of 6 . The tissues are so soft and top quality without shredding like some tissues and with this pack you can put it in your purse or bag for convenience as well. Can’t live without these in Winter. So soft and gentle on my nose when the dreaded lurgy sets in! Handy to have in my bag, the car, on my desk and at home! Great through allergy season too! As a chronic sinus sufferer, I go through a lot of tissues daily. I really love the Kleenex Aloe Vera range! The tissues a really nice and soft and don’t irritate my nose at all. The smaller packs a great to put in the car, in my handbag and in my pocket. Affordable and one for everybody, the car, the bags. I love buying this pack of six pocket sized tissues every so often. The tissues are soft too. Gives kids some ownership of own pack too in school or sports bags. Oh no I’ve got the sniffles! no worries I always have a pocket pack of tissues in my bag. Small in size but big on value. Love this one. I love Kleenex with Aloe and these small packs are perfect for keeping in handbag, when travelling, keeping at work, in the car and sending with the kids in their school bags. The little packs are so convenient and the Aloe soothes. Sometimes it’s the little things in life that are so perfect, just like Kleenex. Great for in the car, School bags, and handbags especially during winter. Handy for the nappy bag! These are great, i have a spare packet in my nappy bag at all times for my son, they are soft on his little nose too which is a bonus! Kleenex To Go Facial Tissues with Aloe Vera are perfect for my purse. I use these handy little packs all of the time and just love them. They are soft on the skin and the perfect size for a purse and handbag. 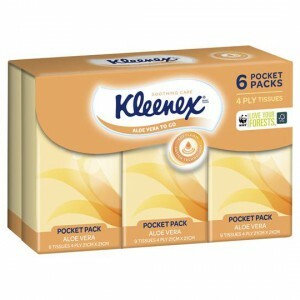 How would you rate Kleenex To Go Facial Tissues Aloe Vera Pocket Pack?